Many (if not most) people dislike ironing. This is funny to me, since I do it every day for one reason or another. Usually it is due to my sewing/quilting work and so I really never thought about it as a chore, but more of a wonderful and helpful thing. 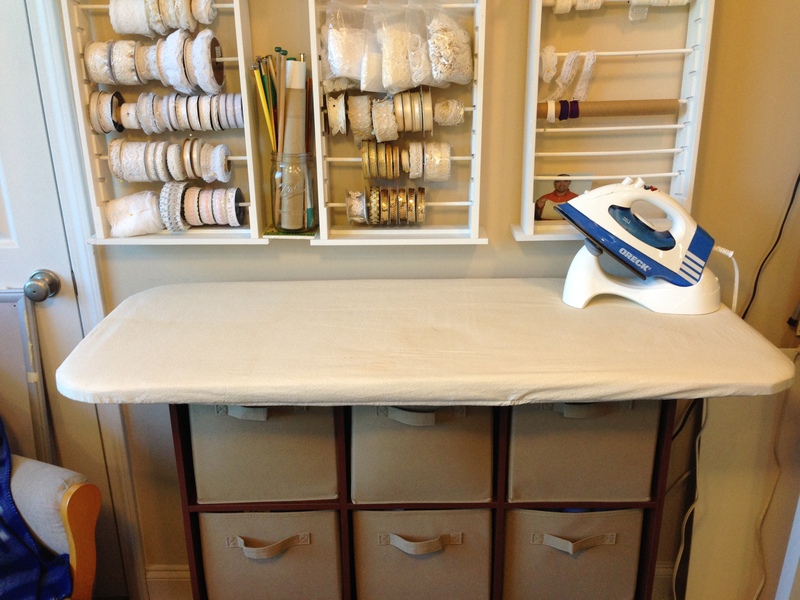 The only thing that kept me from really enjoying ironing was the size and shape of my store bought (el-cheapo) ironing board. You know the one, the collapsible metal board with the pointy end. These boards were NEVER wide enough for my needs. The stores sell a larger board at a LARGER price and that just would not do. So, as always, enter the mother of invention, necessity. A while back a 9-cubbyhole shelf unit was graciously donated to me and I have been using it as a storage place for various items in the bedroom. The other day, it occurred to me that I could buy a board, of any size I like, attach it to the top of the shelf unit and viola instant big board! Our wonderful, thoughtful son helped me round the corners of the board and attach it to the top of the unit with L-brackets. Today I covered the board with a thin layer of cotton batting and then with a top layer of Insul-Bright. The Insul-Bright works better than I expected. It reflects the heat from the iron back up helping to iron the piece from both top and bottom at the same time. After sewing a custom cover, which still needs to be tightened a bit, here is the final result. 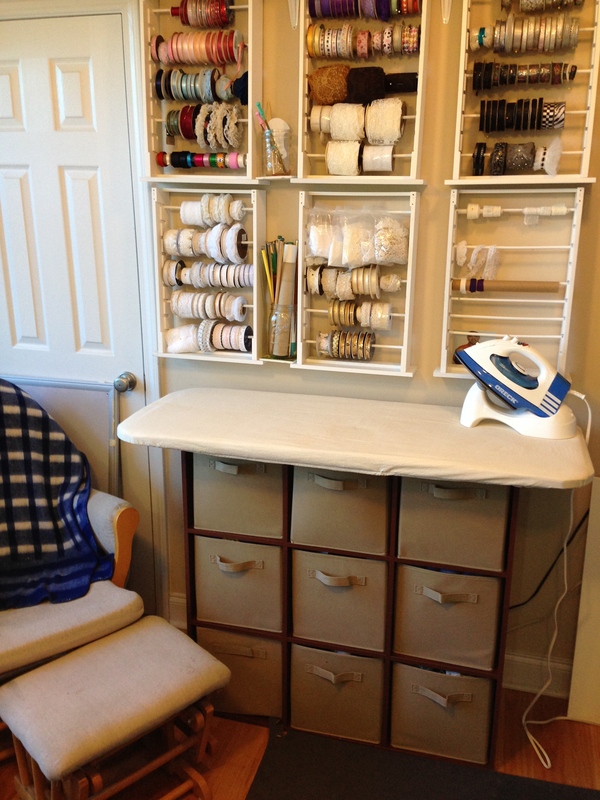 My sewing room is on the small side, so I made it a tad smaller than I would have in my dream sewing room…LOL. 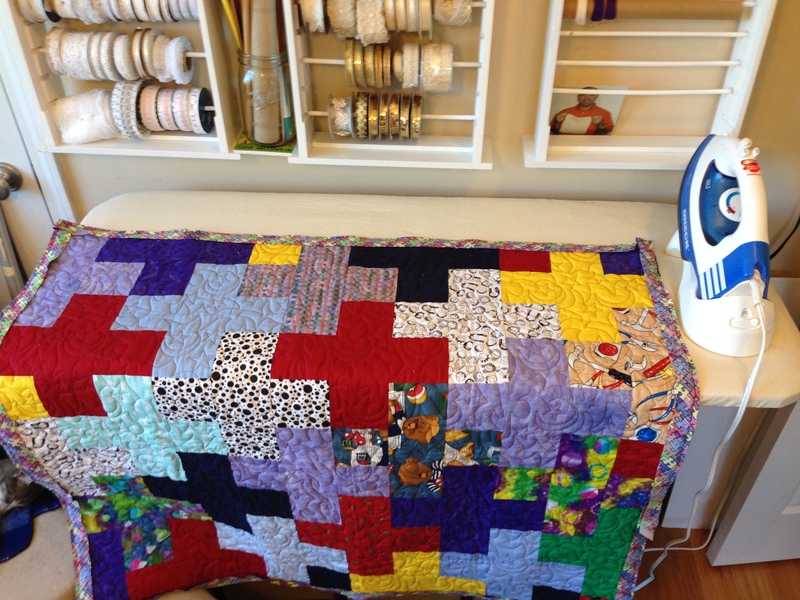 However, the finished top is 24 x 48 and it can accommodate a baby quilt nicely, without the side of the quilt hanging off the pointy end (there isn’t one, yay). As inventive as ever! Great idea!